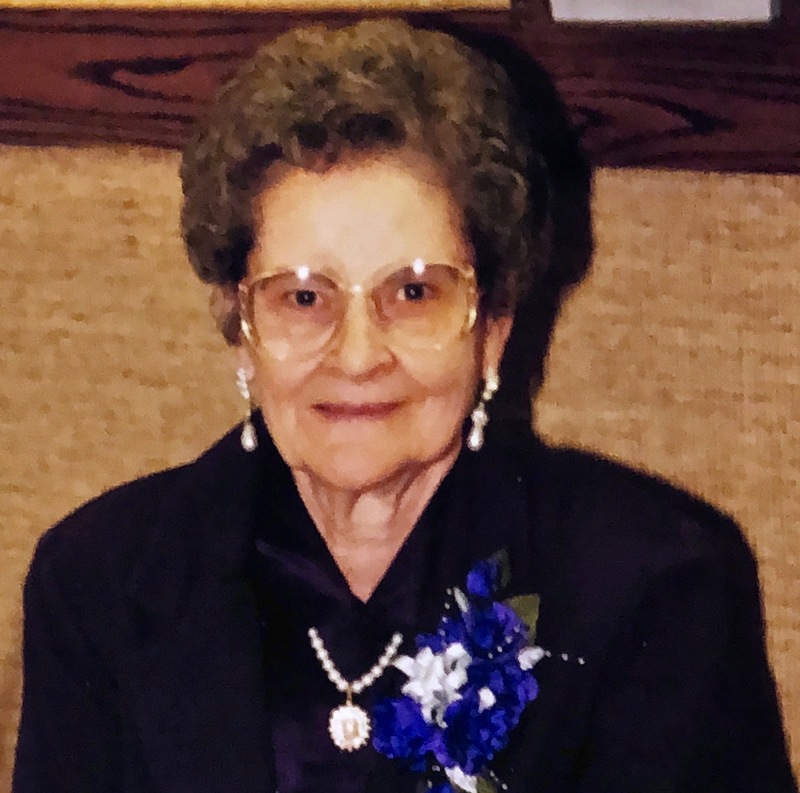 Helen Oberlander, age 85, of Miles City. Helen Oberlander left this earth to join her heavenly family on September 7, 2018 at Edgewood Senior Living in Helena, Montana. Helen was born to Christ and Louise (Straub) Schuetzle on October 10, 1932 at the family farm just outside of Plevna, Montana. Helen graduated from Plevna High School in 1949 at age 16 and was married to Ruben Oberlander on September 4, 1949. Ruben and Helen celebrated their 69th wedding anniversary just 3 days before her passing. Their son, Dale, joined the family in January of 1951 and their daughter, Denise, in November of 1955. Helen and Ruben lived in Plevna, Baker, Glendive, and Sidney, Montana, and Jamestown and Dickinson, North Dakota before settling in Miles City, Montana in January of 1962. Helen worked in various part time jobs while raising her family and later worked for Barber Transportation, Miles City Chamber of Commerce, and retired after working with her husband at their Sears Roebuck Agency store. She also volunteered her time at Holy Rosary Healthcare-something she truly enjoyed. The “job” she cherished more than anything was as the lunch lady “Grandma” at Lincoln School. She loved when those kids no matter how old they were greeted her as “Grandma” anywhere they saw her. She encouraged many a child to eat a good lunch. She was a gifted artist and crafter. Her handiwork, stained glass, ceramic nativity sets, flower arrangements, and miniature dollhouses are treasured heirlooms. She recreated a porcelain doll for her mother exactly like the one her mother had to give up in Russia. Her flower garden was beautiful and her hydrangeas are still blooming this fall. She loved all God’s creatures: birds and rabbits outside and her cats and cockatiels living inside. She was a lifelong learner whether it be taking classes at the college or teaching herself French before taking a trip to France. Before every trip, she wrote letters and researched places to visit. Above all, Helen loves her family and her faith. She was a member of the First United Methodist Church for 56 years. She has a precious relationship with her Savior and we always knew her prayers were heard and answered by the Lord- even her prayers for snow in Berkeley, California. Helen’s prayers for her children, grandchildren, and great-grandchildren reflected love beyond measure. She is survived by her husband, Ruben, her children Dale (Jane) Oberlander, and Denise (Jay) Harvey; her grandchildren Kiara Held, Jeff Oberlander, Christa (Mark) Schoenfeld, Charles Harvey, and Jason (Marcia) Oberlander; her great-grandchildren Rylie, Rori, and Bryce Schoenfeld; Trae, Kaeden, and Chaes Oberlander; Zyrie Held, and Landon Oberlander. She is also survived by her brother Reuben (Beverly) Schuetzle, her sister-in-law Viola Schuetzle, brother-in-law Leonard Oberlander, and many cherished nieces, nephews, and caring neighbors. She was preceded in death by her parents and her siblings Robert Schuetzle, Elsie Huether, Verner Schuetzle, Lily Klos, and Arthur Schuetzle. The family requests any memorials be made to the Salvation Army, 2910 S. 30th Street, Billings, MT. My thoughts and prayers are with you at this time and in the days ahead. Ruben, Dale,Denise and families, We can’t express how sad we are to see the passing of your loved one, My husband Ruben says another one of our classmates gone. May you feel the presence of God during this sad time and in the days ahead. May God bless you all with the consolation that she is no longer suffering. She will be greatly missed by you all. Our thoughts and prayers are with you all. Ruben. I am so sorry that it had to happen like this. I will be thinking about you and praying for you in your struggle. Please accept our condolences and know that we will be lifting you up in prayer. I know you have so many wonderful memories. Hold them close. Helen was a grand person! It was an honor to know her. We send our deepest condolences to all of the family at this tender time. We send our heart felt sympathies to you and want you to know that we loved Helen, and we will miss her smiling face. There is not enough space here to say all I would like to say, but the memories I have of her since we have been here are so special. She was a lovely lady and will always remember the wonderful greetings I got every time we met. There were a lot of Sundays that she would bring some flowers from her garden, and they would brighten my day. I remember a small yellow rose from a rose bush that she said was sent from where her mother was born , and still have it. it meant a lot to me. There will be many wonderful memories to remember, and share and may you hold them dear, and forever close. I remember the wonderful cockatiels that were so special to you, and when I would hear them talk in the back ground when I would call on the phone. I think i said once about having to watch what you say, as your birds will repeat ,and Helen would just giggle and say ” I try to be careful”, isn’t that right Reuben. It saddened us to see Helen struggle in the past year especially and you Reuben were such a wonderful husband in taking care of her like you did for 69 years, and the love that you showed. So glad that you had the time that you did with her since she moved to Helena, and especially the few days before your 69th Anniversary, and on that day before returning home. How special that was, and now Helen is at peace and walking with her lord and Savior, and knowing Helen, I know that she is looking down and saying Thank you Reuben and to all family for loving me, and that she loves you and that she is now o.k. May you feel His Presence, and may you feel comfort, love and peace knowing that she isn’t struggling anymore, and at peace. God Bless each and everyone of you. This side of eternity will miss a talented artist and hobbyist; a devoted bird lover; a volunteer who gave countless hours to our community; and a loving mother, grandmother, and great-grandmother. The other side of eternity just received home a precious soul who will continue to bless her family in a new and transcendent way. Blessings to all of Helen’s family members. God be with you. So sorry to hear this! I enjoyed working with Helen when she volunteered at HRH. I will miss seeing her around! Prayers to her family! Ruben, Dale & Denise – so sorry to hear this news. May you hold your memories close & may they give you comfort during this difficult time. My thoughts & prayers go out to you all. My prayers to all of Helen’s family. To all of Helen’s family: we hope that you all find comfort in the many years and wonderful memories you have with each other. Our sincere condolences to you all. Denise–So sorry to hear of your mothers passing–May she rest in peace. You && family are in my thoughts & prayers. Ruben, Dale, Denise and families, I was sorry to hear of Helen’s passing. Sending prayers to everyone. Dear Rube, and family, Goodbye to an old friend. We will miss her wonderful sense of humor and contagious laugh. Our prayers are with you all. Sorry to learn of Helen’s passing. Many good memories of the Oberlander family at Sunday church and at school events. Prayers are with you at this time. What a wonderful legacy your wife, mother and grandmother and great grandmother has given you. May the sweet memories she Has provided, always bring a smile to your face. Heaven has certainly gained a special angel that now watches over you! Our deepest sympathies. May you rest in peace. Sorry to hear of Helen’s passing. We have such wonderful memories of Helen. Helen was a gem and a woman I will always remember with great fondness. I was the personal recipient of her thoughtful gestures and felt like a special part of her life. God be with you all in your time of mourning. Helen made the world a better place. Dear Denise and family, so sorry to hear about the loss of your Mom, my prayers are with all of you at this difficult time. We are sorry for your loss of Helen. Her and mom were friends for many years.. I am sorry to hear of Aunt Helen’s passing. I have many happy memories of the times us cousins spent time together and remember Aunt Helen’s wonderful contagious laugh. While we haven’t been able to spend much time together recently, just know that you are all in our thoughts and prayers. Sorry to learn of Helen’s passing. I have happy memories of times visiting with her. She was a wonderful person and has left many memories ~ not only to you and family but to community members as well. Dear Ruben, Denise, Dale and families, So sorry to hear that Helen has passed away. You are all in our thoughts and prayers. Mr. Oberlander, Denise, Dale and families, I am so sorry for your loss. Like others who have written here, I have been a blessed recipient of such kindness from both Mr. and Mrs. Oberlander. Each and every time I would run into them somewhere, they would greet me with fondness and relate some story about Denise and I when we were little girls, neighbors, and playmates in Glendive. It warmed my heart. I will miss that. I know that your dear mother, wife and grandmother is at peace and rests now with the angels, and that this goodbye is not the end. May God’s comfort and blessings be with you all. I am so sorry to hear of Helen’s passing. I absolutely loved waiting on her at the Airport Inn. This just breaks my heart. My condolences to the family. May God be with you. To all of Helen’s family, we are so sorry for your loss. Helen was a special lady and she will be missed by so many. May you be comforted in your loss as you navigate the days ahead. So sorry to hear your Mother has passed away. Cherish all your memories of your time spent with her and those memories will bring a smile to your face each time you remember one of them. I am so glad you are here in Miles City for your Dad. Sympathy to you and your family. Denise and family: So sorry to hear about your Mom — I loved visiting with her whenever our paths crossed — she was a very special lady and friend to many — our thoughts and prayers are with your family. Aunt Helen’s warm way of greeting people will really be missed by all of us. I am sorry to hear about your mom. She will be greatly missed by all of you. My condolences on Helen’s passing. Holy Rosary Healthcare is a bit dimmer now that her sparkle is gone. We are sorry to hear of Aunt Helen’s passing. I know that she had medical struggles for many years and are glad that she is now at peace. Her memory will live on. Since we live in Texas we didn’t come to visit very often, but it was always a pleasure to do so. We knew that we were welcome and that we would enjoy our visit. She was always a warm and loving person. We will remember her and all of you in our thoughts and prayers. Our sincerest sympathies to the entire Oberlander family. Helen was a beautiful woman inside and out. My thoughts and prayers are with you. Denise, Dale : I am sorry to hear about your Mom. I loved visiting with her; she had a wonderful personality. My prayers for you all. Thoughts and prayers. Always enjoyed visiting with Helen especially about the yard, garden and flowers she loved to grow. Rest peacefully sweet lady. So sorry for your loss. Thoughts and prayers are with all of you! So enjoyed visiting with her. So sorry, Rueben and family. She will be greatly missed by many friends as well as family. Mr. Oberlander, Denise and Dale, My sincere sympathies to you and your families. Helen was a wonderful person. Blessings in this time of sorrow. Sending our deepest condolences and prayers to all of the family. Helen was such a beautiful person who always spoke to us when we saw her. She was a mentor and spiritual guide to Ari and he cared deeply for both she and Rueben. Denise, your mom was amazing and I am so sorry for your loss. My thoughts and prayers are with all of you. We were sad to hear of Helen’s passing. Both Reuben and Helen were always so good to us during our years in Miles City. It is our prayer that memories of good times shared bring you comfort in days ahead.